It’s taken a few years to finally sort out but at last we are proud to announce that this Thursday, 29th November from 19:00GMT The Commentators will be bringing you live and exclusive radio commentary of Birmingham Royal Ballet’s performance of The Nutcracker. Coverage will be streamed life from this website and there will be no ‘listen again’ facility so make sure are near a computer/smart phone on Thursday to hear Ballet on the Radio. We approached BRB director David Bintley with our proposal a number of years ago. There had been some schepticism about my chances of persuading the esteemed choreographer to let our washed up sports radio commentators loose on one of his cherished company’s productions, but as soon as I saw an Aston Villa mug on his desk I knew it would be a breeze and so it proved, no persuasion was necessary. David immediately understood the idea and seemed delighted by it, we agreed it had to happen. The Nutcracker has been chosen as, being one of the world’s most famous ballets a proportion of the audience will be able to picture it in their minds-eye and compare that image with The Commentator’s description of it. Being such a canonical work The Nutcracker is a robust enough cultural object to survive further processing, even if this an audio only version. Back in June we had a test commentary during a piano rehearsal of Romeo and Juliette. We set up in the Hippodrome’s Royal Box, using some perspex sound baffles to keep us from distracting audience members seated nearby. The Royal Box has an ante-room which, conveniently, is kitted out with a Ethernet socket. Streaming our commentary out over the internet wasn’t a problem, no one could hear us in the auditorium a few admin details had to be sorted out and we’re ready to go on Thursday. 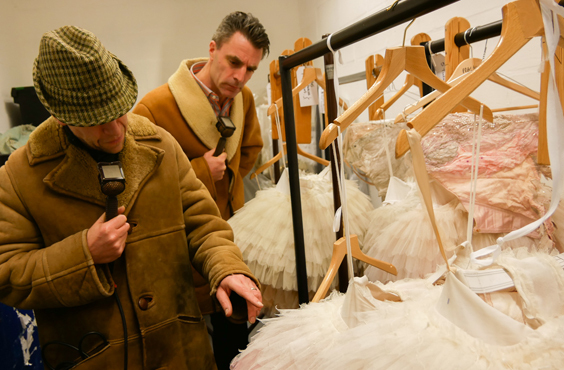 This is David Bintley’s last season at BRB so Thursday will probably be a one-off, we hope you can tune in.